Darjeeling: The Gorkha Janamukti Morcha has given a ten-day deadline to the Centre to intervene in the Gorkhaland statehood stir as the indefinite shutdown in the hills entered its 47th day on Monday. "We have given a ten-day deadline to the Union government to intervene. An indefinite shutdown is going on for the last 47 days. The Centre can't just sit idle when the hills are burning," GJM assistant general secretary Binay Tamang told reporters on Sunday night. The 30-member Gorkhaland Movement Coordination Committee (GMCC), a body of all the hill parties of Darjeeling, is in Delhi for an all-party meeting. The GMCC has sought an appointment with Union home minister Rajnath Singh to brief him on the ongoing crisis in the hills. "We have sought a meeting with Union Home Minister Rajnath Singh in order to brief him on the ongoing crisis in the hills. The indefinite shutdown has entered its 47th day, which is the longest-ever shutdown in the history of Darjeeling. The Centre needs to take concrete action," Bharatiya Gorkha Parisangh president Sukhman Moktan told PTI. The police and security forces patrolled the streets of the hills and kept a tight vigil at all entry and exit routes. 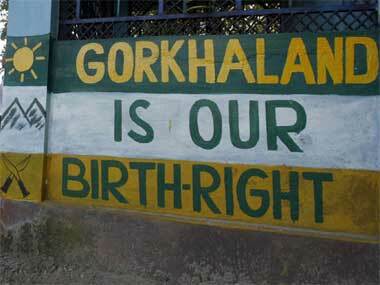 Normal life remained crippled during the indefinite strike to press for a separate Gorkhaland state. Barring medicine shops, business establishments, restaurants, hotels, schools and colleges remained closed.